We have arrived at a moment in which we have to use our talents, wisdom, knowledge and experience in order to preserve ourselves and the planet we live on. It is time to respect each other and listen to each other regardless race, gender, profession or age. Our ancestors were raised with wise proverbs and sayings. Where are the wise people of the present modern society? Jesus spoke in proverbs and parables, scientists contribute to the solution of human problems, visual artists inform people in metaphorical ways. Art can help achieve peace and harmony among people. 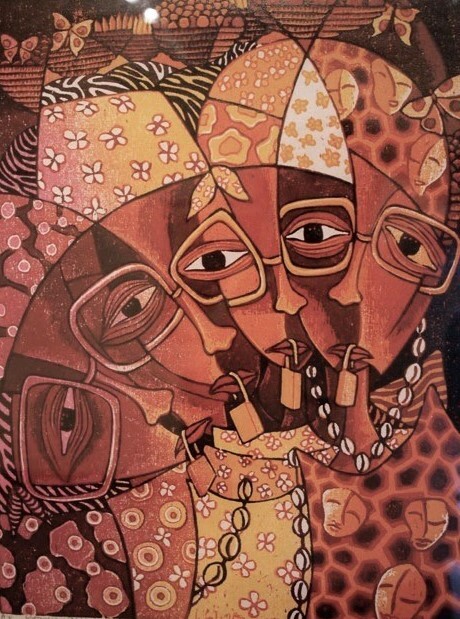 Fred Kato Mutebi is not only a master in the technique of the woodcut, he also connects with the viewer through the narratives in his work. To focus our attention on the stories about the struggles in his country and the world, Fred Mutebi chooses his characters and details with care. By way of these images and symbols we can identify with the reality and currents events in his country. Presently there are many orphans in his country due to the destruction of families and the HIV-Aids epidemic. Uganda is also afflicted by regional conflicts and the worldwide battle for natural resources. 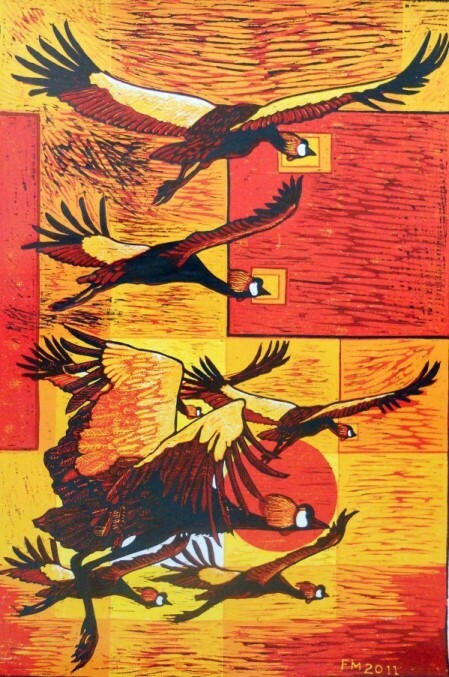 The multi-colour woodcut-print Ensobi Yaani (Luganda for Who is to Blame?) deals with Fred Mutebi’s inner struggle in relation to his country and our world. He made it when the FIFA Worldcup was going on in South Africa. The players are entangled in battle and their arms, legs and torsos are chaotically entwined. This symbolizes the problems that pile themselves up in Africa. “How can we prevent Africa from being placed in the shadow of the monumental world problems?”, Mutebi wonders – problems connected to poverty, hunger, war, sickness and illiteracy, infant mortality and the ill health of mothers, but also to environmental destruction and sustainability. On the ball a map of the African continent is depicted. The keeper, who just misses catching the ball, appears to be split in two as if he plays for both teams. The lively colours and patterns of the uniforms make clear that is it is not only about the people of Africa, but also about the environment, by referring to the wildlife of Uganda. In the series Women Activists Now and Then Fred Mutebi focuses on the many roles women play in Ugandan society, from the anonymous sellers of goods of the past to the activists of the present. He portrays their struggle to survive, but also their importance. 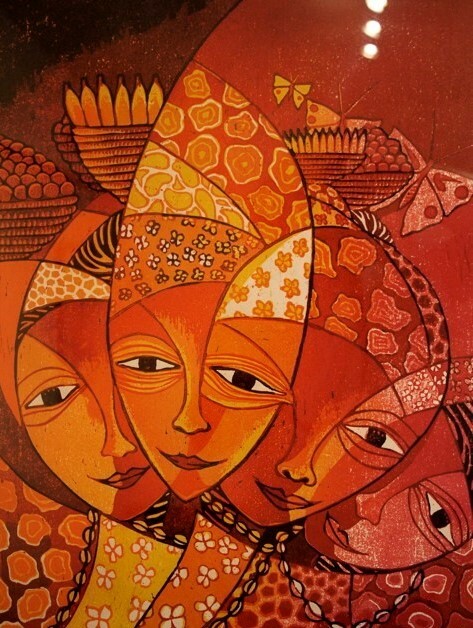 Characteristic is the double use of the eyes, which he employs to show the mutual connectedness that is so typical for African women. Their facial expressions are content. In the second series of woodcuts the age and individuality of the women is lost. The changing intensity of the colours refers to the passage of time. The sealed lips, the broken necklaces and the small masks (below to the right) point to the oppression of women. 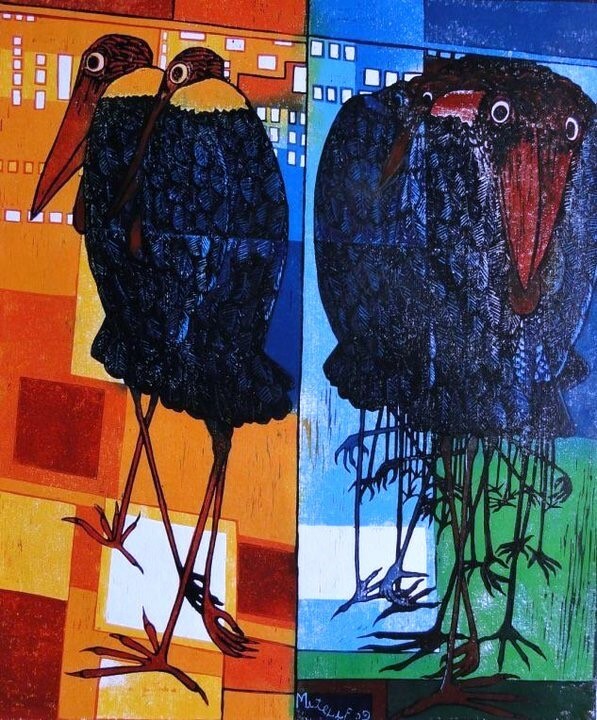 In Mutebi’s work the marabou is a symbol for the politicians in Uganda. He calls them ‘the devourers who only think of themselves.” Mutebi uses the animals that are native to Uganda as symbols. Zebras with their powerful hearing and eyesight for instance are a metaphor for alertness. Butterflies symbolize renewal. In Task Force Mutebi humanizes the garbage hunting marabou. This bird has an almost bold, dirty-pink head with a hanging crop. In the work we see the large bill and the gular sac, which functions as storage for food. Marabous like to live close to people and in the company of their kind. They eat animals alive and dead, for instance fish, grasshoppers, frogs and mice, but also crocodile eggs and bird chicks. Their bodies and heads are here so close to each other that they merge into an ominous mass. The marabous seem to be talking with each other, but they are really looking for the satisfaction of their own needs and not for a real meeting with each other. In this way Mutebi refers to the problems of his country. Crest Crane in Flight reveals Mutebi’s warm heart for his country. This bird is the icon of Uganda and is depicted in the Ugandan flag. The artist stylizes the original form of the birds, so that they express what he wants them to tell. 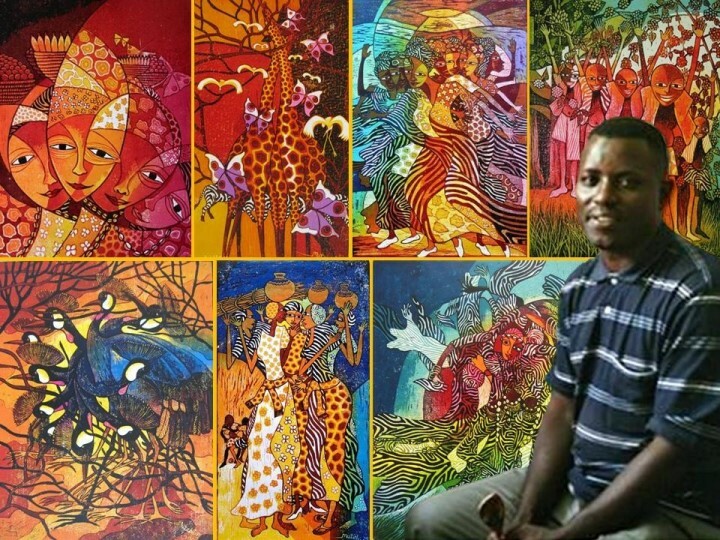 As an artist and teacher Mutebi deems it of great importance that art is used to inform people, especially the younger generation, about the problems in his country. This group of birds is united in flight: with their wings spread out and their heads down they are all heading in the same direction. The setting sun in the background emphasizes that they are headed for a peaceful future. Even though the problems in Uganda are complex and the hardships many, Fred Mutebi does not leave the viewer behind without hope. Fred Mutebi is also involved in BOTFA (Bukomansimbi Organic Tree Farmers Association) and MUTI (Management Union of Trees International) to revitalize and promote the use of indigenous bark cloth.